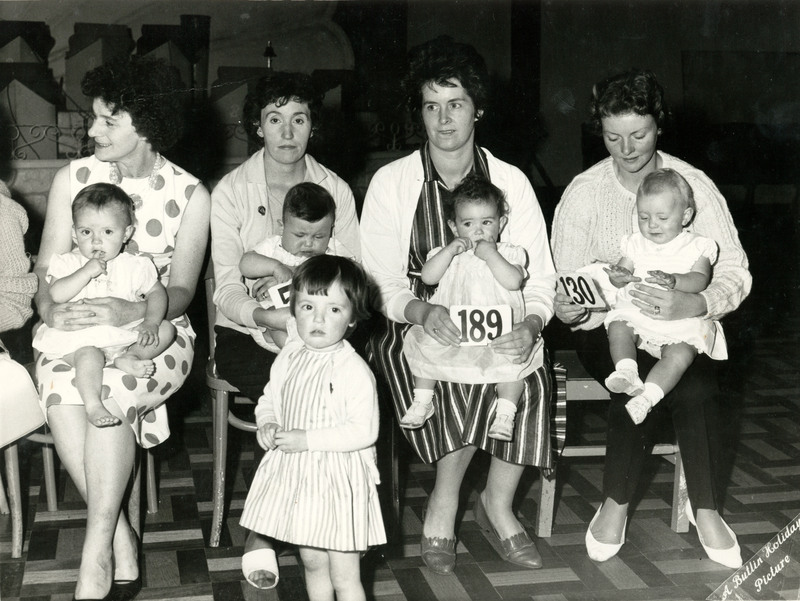 Photo: In 1964, at the tender age of one, I won the ‘Bonnie Baby’ competition in Butlins Mosney. I was a lovely baby, of course, but aren’t we all. However, I’m very proud of winning my only competition, and my prize was a squeezy ‘Tom Tom The Piper’s Son’ (who stole a pig) complete with pig, and it smelled of rubber, and squeaked when squeezed. When I was a child, the sound of my mother singing was… like hearing an angel right beside you. Her range and resonance, her natural vibrato – it galvanised me: I’d just stop whatever I was doing and listen, hoping she’d wouldn’t stop. As she got older, her voice didn’t change but her breathing did. However, I can hear her singing ‘Mona Lisa’ in my memory and can think of nothing more beautiful. My mum, now almost 92, can be the most charming of women: flirtatious, cheeky, hot-headed at times. She and I have been told we’re like each-other in looks and personality, and to a large degree it’s true, and I like it. I’ve also inherited the shape of her hands, except hers were more beautiful than mine could ever be. She was always immaculately groomed. Watching her smoking a cigarette, moving those graceful hands, she looked quite glamourous. Mum was born and raised in ‘historical’ Balnavoran in Co Meath, where, as children, we would go for six weeks in the summer to be with our grand-father, Frank Martin. Grandad had about 50 acres, and a big old farmhouse complete with orchard, haggard, hay loft, goat (in the haggard), bubbling streams fore and aft, but no electricity, no running water – and it was heavenly. It wasn’t a holiday, as such, as we were expected to pitch in (Grandad even had a tiny little hayfork for me, aged five or six! ); certainly not a vacation for Mum, who cleaned the house from top to bottom, did all the cooking, baked bread, laundered… but she loved being there, and we’d sit at the range in the evening, paraffin lamps lit, and Mum and Grandad would talk, reminiscing and telling stories. Later, my sister Martha, Mum and I would regularly go to Carrickmacross and its environs for visits, which of course included several funerals. Mum loves nothing more than seeing her two daughters dressed impeccably and respectfully. On one of these occasions, as we walked towards the graveside, an elderly gentleman dressed in a camel-hair coat (belted, for some reason…) saw my mother and launched himself towards us, almost falling into the open grave. The two of them were thrilled to see each-other – I don’t even remember who he was – but at one stage he asked myself and Martha “Did you ever hear your mother sing in the Meath Hill Choir?”, which he followed with a rapturous description of her talent – all in a strong Monaghan accent. Myself and my sister were in giblets laughing (or trying not to, but egg each-other on at times, and it can be hilarious – I’ve often cried laughing). Mum and I went to New Zealand together in 1974 – I was eleven and she was 51 – and it was a huge adventure. Unfortunately, we didn’t get the required shots early enough and travelling that distance feeling ill is not fun. We were both very sick by the time we got to Wellington, and our luggage had gone missing. We had nothing. Things went from bad to worse – for instance, Heathrow on the way out… we were on the wrong bus, which was booting along the motorway when I realised incoming ‘planes were flying in the other direction. I talked the driver into stopping – an express bus that doesn’t stop – but we were distraught and he took pity on us. We had an overnight in Heathrow, and Las Vegas, and a stop-over in Hawaii. We were visiting a cousin of my mother’s – his mother and my maternal grand-mother were sisters – who wanted to meet some of his Irish family but was too ill to travel. He had extensive siblings, and they were lovely welcoming people, but we were desperately homesick. What was to be a three-month visit turned into a three-week stay. Coming in to land and seeing the coast of Ireland brought tears to our eyes. Mum and I have always had an interesting relationship. She said to me once, when I was very young, “you have an answer for everything”. She’d also describe me as ‘old-fashioned’ – precocious. All true. A formidable woman, rarely would anyone face her down. I did – and sometimes just for badness to get her riled. Mum got me my first guitar when I was about ten: a red Hummingbird I spotted in the window a Dun Laoghaire pawn shop. One day a week we’d go to Dun Laoghaire and have pizza, baked potato and coleslaw in Pizzaland, and on one of these days I saw the guitar. She sauntered into the shop and bought it. Impulsive, and generous to a fault, she didn’t know what that would mean to me – because of that guitar I got my first gig. Mum loves dancing – she and my father were both excellent ballroom dancers. One night I picked her up (from the Ierne? Olympic? ): she was proud to introduce me to her friends, and then she insisted we do a foxtrot – with her leading, obviously, as I’d never done it before. It was such fun, and I think she was happy that night. And her cooking… for example, one night I arrived home and she was eating a boiled onion with white sauce. I might have had the munchies, but was thinking: ‘boiled onion?’ It was delicious, and I ate it all and she had to go and make another one for herself.